Buy L'Oreal Professionnel Mythic Oil Shampoo in India on Nykaa. 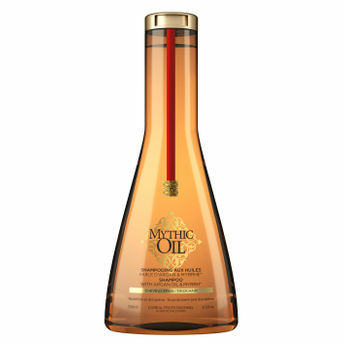 Give your hair a daily dose of moisture with L'Oreal Professionnel Mythic Oil Shampoo. The perfect combination of argan oil and cottonseed oil leaves hair deeply conditioned and gives a long lasting shine to dry hair. It's a luxurious shampooing experience which refreshes and cleanses hair thoroughly. Cleanses hair for a fresh feeling scalp. Infused with Argan oil, which is known for it's calming properties. Makes hair manageable without weighing it down. Additional Information : L'Oreal Professionnel believes in the powerful combination of advanced research and Professionel expertise to create products that your hair always wanted. Innovative products, tested and approved by the biggest names in hairdressing, L'oreal Professionelmaintains the highest standards of quality in terms of performance, comfort and safety with an extensive range of hair care, styling and colour products that suit all hair types. Explore the entire range of Shampoo available on Nykaa. Shop more L'Oreal Professionnel products here.You can browse through the complete world of L'Oreal Professionnel Shampoo .